Located on beautiful St. John Virgin Islands, very private villas sit high overlooking the gorgeous waters of the Caribbean, some of its cays and St. Thomas lit up like a Christmas tree at night. Awesome sunsets may be seen from your own private outside deck, or from the pool deck. Villas are 1 bedroom (queen), 1 bath. 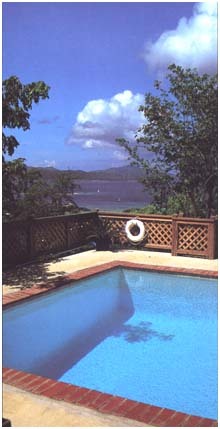 10 minute walk into Cruz Bay and minutes from the Virgin Islands National Park. Located within a few miles of some of the most beautiful beaches in the world. There are only 4 villas in the development and they are very private and secluded. The pool is only a few steps from the front door and is perfect for a refreshing dip. The pool deck, which is thoughtfully set among a group of coconut palms, is great for sunbathing and enjoying the sunset view. An abundance of lush, well maintained flowers, trees and natural greenery surrounds the buildings, walkways, pool and the deck, creating a very tropical environment. Private decks, fully equipped tiled kitchen, carpeted dining/living room, air conditioned bedroom (and most villas have air conditioning throughout), Queen size sofa sleeper in Living Area, TV, phone, safe, tiled bathroom, ceiling fans, opening screen windows, and on site parking. All of our villas are NO SMOKING units. St. John Virgin Islands is wonderful for nature lovers. You will see Bananaquits galore. Known as the 'sugar bird', it is the island's most popular bird. The Antillean Crested Hummingbird is usually around. Other birds such as the Pearly-eyed Thrasher, Ani, and Antillian Bulfinch can be seen among the tropical gardens. At the many white sand beaches 10 to 20 minutes away, you will see Pelicans, Terns, Gulls, overhead Frigate Birds, and more. Snorkeling and diving the underwater world can also be fantastic. Some of the mammals are the mongoose, ferrel donkeys, an occasional deer and several species of anole (lizard). There is live music at night in town at several places. Select an option below for more information. Or see your professional travel agent. The making of your reservation and sending in your deposit or payment constitutes your acknowledgement you have read, understood, and contractually agreed to all terms and conditions contained within this web site. Most recent update January, 2009.